Hi all! 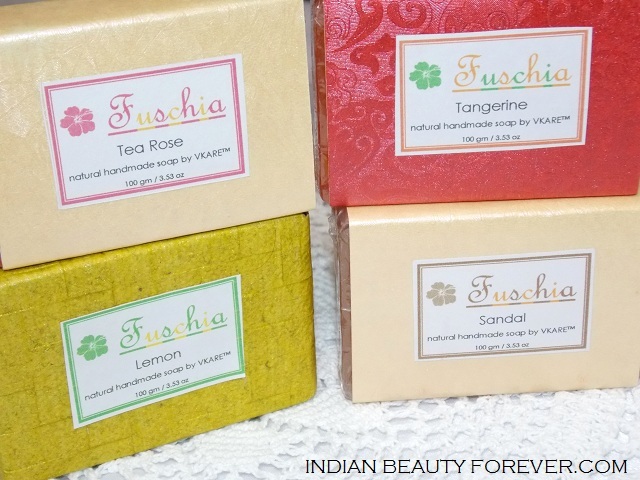 I will review these 4 Vkare Fuschia handmade soaps in the aromatic fragrances like sandal, lemon, Tea rose and tangerine. I have reviewed their lip balms some time ago, if you remember. Vkare Biosciences launched these soaps and handmade lipbalms as the fuschia natural cosmetics range. The soaps are basically glycerine soaps with various essences. These soaps are priced at 225 Rupees for a bar of 100 grams. These are available at Vkarebiosciences.com or at Snapdeal.com at some discount. These handmade soaps are available in loads of variants like choco butter, floral musk (which sounds really good) camellia, spearmint, strawberry passion and the ones that I have received along with some other variants. The soaps are packaged in thin plastic sheet over which textured colored papers are wrapped, that gives them a striking eye catching feel. Vkare Fuschia handmade soap in Lemon smells like refreshing lemons as the name suggests while Vkare Fuschia handmade soap in tangerine has slightly citrusy orangey scent to it which I liked better than the lemon one. Both of these lather well and the fragrance lingers for around 15-20 minutes after the shower. 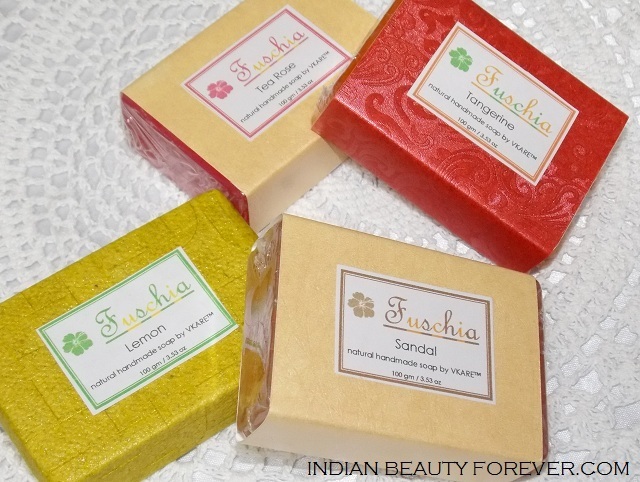 Fuschia handmade soap in sandal has woody sandalwood fragrance though that doesn’t stay as long as the other two variants like lemon and tangerine do. The other variant Tea rose has a mild subtle floral fragrance which is quite soothing. The reddish bar looks nice. 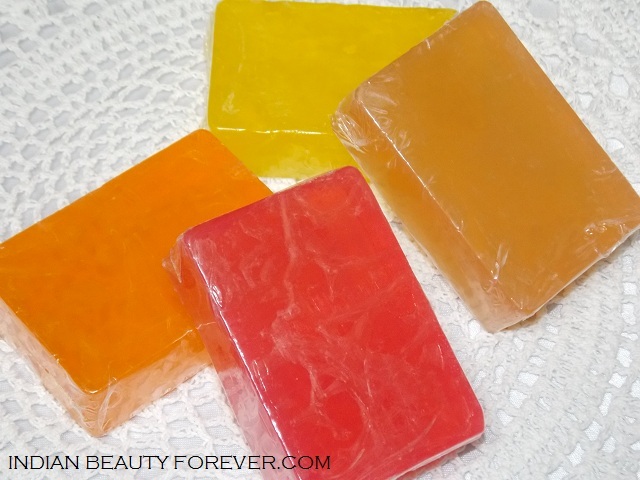 In fact, if you will see the soaps look attractive with candy colors. Other than the fragrance and the scent, all these soaps share common features and characteristics like they are handmade glycerine soaps with some essential oils into them. They have to be stored properly in a dry place after the use as they are prone to melt easily. They last lesser than the regular soaps though. These soaps lather well and quite creamy lathers are formed that remove dirt and grease gently. They do hydrate the skin but moisturization is required after the shower keeping in mind the season. I find these Vkare Fuschia handmade soaps to be decent and reasonable as most of the glycerine handmade soaps are priced within this range only. Online they are available at snapdeal.com, in case you wish to get them a try. PR sample though the review is unbiased as always!